The Emirates Towers Business Park ... construction to commence by the year-end. The Emirates Towers Business Park will be an integrated district that meets the demands of modern-day businessmen. Dubai Holding has launched the Emirates Towers Business Park to be developed at a cost of Dh5 billion ($1.36 billion) on an area between Sheikh Zayed Road and Happiness Street in Dubai. The integrated business district will be built in close proximity to Dubai International Financial Centre (DIFC), the leading financial hub for the Middle East and Africa (MEA) and South Asia region. Emirates Towers Business Park will boast a suite of office space, hospitality, commercial amenities and purpose-built infrastructure to support the growth of businesses. Construction will commence by the end of 2017 with completion aimed within four years. Masterplanned by Dubai Holding, the development was launched last month by HH Sheikh Mohammed bin Rashid Al Maktoum, Vice President and Prime Minister of the UAE and Ruler of Dubai. The emirate’s strategic location and advanced infrastructure presents the ideal choice for companies looking to strengthen their presence in the region and expand their reach, says Dubai Holding. Emirates Towers Business Park will meet the increasing demand for Grade A office space through hi- and low-rise office towers catering to a range of requirements. The development will include three five-star hotels. 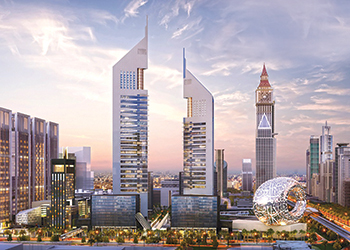 Jumeirah Group will manage one, while the other two will be managed by leading international hospitality groups. It will also offer retail space with a range of international brands and food and beverage (F&B) options and a dedicated arena for events and ancillary facilities to support corporates. Dubai Holding says the project will be interspersed with public parks, green space and will include two covered pedestrian bridges connecting to the DIFC. Upon completion, Emirates Towers Business Park will become an integrated business district in the heart of Dubai’s financial district and will provide a legislative environment with international standards of governance and transparency under the regulations of the DIFC Authority. To ensure ease of access across the development, Emirates Towers Business Park will be supported through a three-level basement with one level dedicated to traffic management, while the other two will provide 13,000 new parking spaces. “Emirates Towers Business Park demonstrates Dubai Holding’s commitment to the economic diversification of Dubai and strengthening its attractiveness as a preferred destination for regional and international corporates looking to leverage the wealth of opportunities for growth and expansion,” he adds.